Fox News has filed a "friend of the court" brief in federal court in support of CNN's lawsuit against the Trump administration for revoking correspondent Jim Acosta's "hard pass," which gives holders expanded access to the White House complex. Acosta's pass was suspended last week, hours after he sparred with the president in a press conference. CBS News also announced it will be filing an amicus brief in support of CNN, saying in a statement it supports the White House Correspondents Association and CNN's legal fight to restore Acosta's access. "We do not believe that revoking White House press credentials is an appropriate remedy for a disagreement the White House may have with a particular reporter," CBS News' statement said. "We intend to file a friend of the court brief in support of CNN's lawsuit to defend its constitutional rights." Fox News anchors and shows are generally supportive of President Trump and his policies — host Sean Hannity appeared at a rally with Mr. Trump earlier this month. Fox News President Jay Wallace said Wednesday the network will file an amicus brief with the U.S. District Court in Washington, D.C.
"Secret Service passes for working White House journalists should never be weaponized," Wallace said in a statement. "While we don't condone the growing antagonistic tone by both the President and the press at recent media avails, we do support a free press, access and open exchanges for the American people." CNN says it has asked the court for an immediate restraining order requiring the pass be returned to Acosta and will seek permanent relief as part of this process. The White House Correspondents Association has said it "strongly supports" the suit. Acosta's access to the White House was purportedly suspended because he refused to give up a microphone to a White House intern who reached over and tried to take it away from him during the press conference last week. 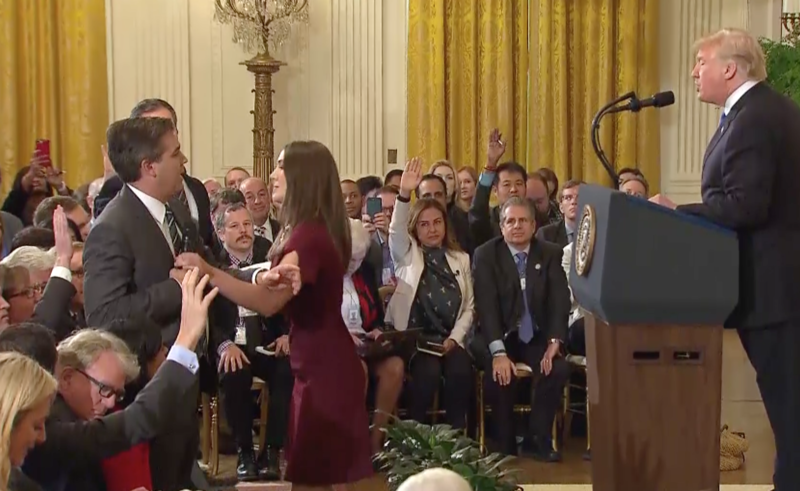 The White House accused Acosta of placing his hands on the young woman and distributed a video of the incident several analysts concluded was doctored and had the effect of exaggerating the moment of contact. White House Press Secretary Sarah Sanders called the lawsuit "just more grandstanding from CNN." Although the White House initially said it was revoking Acosta's hard pass because he laid hands on an intern, Sanders' new statement said he "physically refused to surrender a White House microphone to an intern." Sanders also said the new justification for the removal of his pass was that he did not yield to other reporters for questions. A group of other news organizations, including Fox News, NBC News, the New York Times, the Washington Post and two wire services — AP and Bloomberg — also said they would file a joint amicus brief in support of CNN on Wednesday. The firm Ballard Spahr issued a statement on behalf of The Associated Press; Bloomberg L.P.; First Look Media Works, Inc.; FOX News; Gannett; National Press Club Journalism Institute; NBC News; The New York Times Co.; POLITICO; Press Freedom Defense Fund; E.W. Scripps Company; USA TODAY NETWORK; and The Washington Post. "Whether the news of the day concerns national security, the economy, or the environment, reporters covering the White House must remain free to ask questions. It is imperative that independent journalists have access to the President and his activities, and that journalists are not barred for arbitrary reasons," the statement read. Mr. Trump told the Daily Caller on Wednesday "Jim Acosta is just somebody who gets up and grandstands, he doesn't even know what he's asking you half of the time." He added he thought reporters like Acosta were "bad for the country." The White House filed its memo of opposition against CNN and Acosta's lawsuit ahead of Wednesday's hearing, arguing the First Amendment doesn't guarantee access to the White House. The 23-page memo argues the "president and his staff have absolute discretion over which journalists they grant interviews to, as well as over which journalists they acknowledge at press events. That broad discretion necessarily includes discretion over which journalists receive on-demand access to the White House grounds and special access during White House travel for the purpose of asking questions of the President or his staff." "No journalist has a First Amendment right to enter the White House and the [resident need not survive First Amendment scrutiny whenever he exercises his discretion to deny an individual journalist one of the many hundreds of passes granting on-demand access to the White House complex," the argument continues. The White House memo also makes the case Acosta was given sufficient notice about the suspension of his credentials, saying, Acosta "received notice of the reasons for his pass's revocation the night it happened and again the next day." Counselor to the president Kellyanne Conway, in an interview at a Yahoo financial summit on Tuesday, said Mr. Trump is "very pro-press," and she really doesn't think the First Amendment is "imperiled at the Trump White House." "I think Jim Acosta's been on Twitter the entire time — I'm not sure how his First Amendment rights are abridged. But I haven't read them, the lawsuit. I will tell you I try to be very pro-press, the president is obviously very pro-press. He gives so much availability, now more than ever. ... I really don't think the First Amendment is imperiled at the Trump White House."